People-watching at county and state fairs is one of the best reasons to go. What a chance to relax and watch the world go by on the midway! 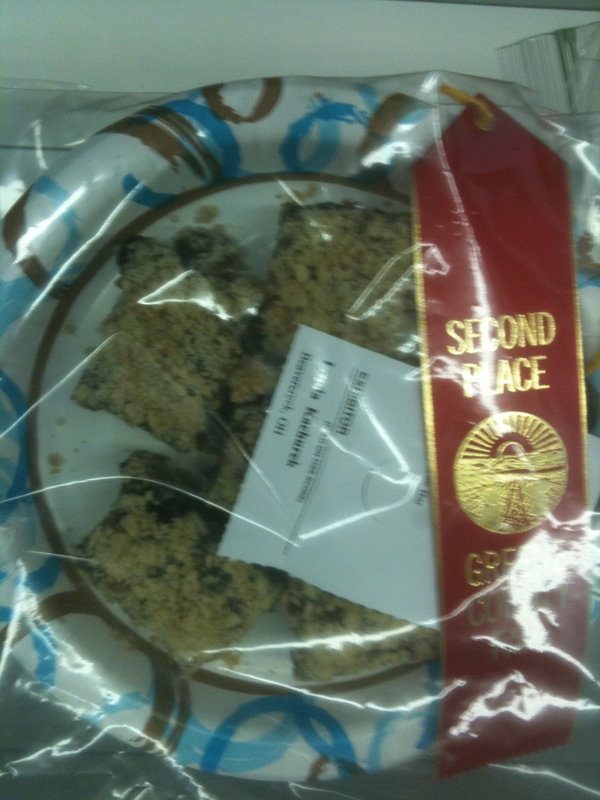 But this year, I had another reason to head to our local county fair – to enter some of my baking. 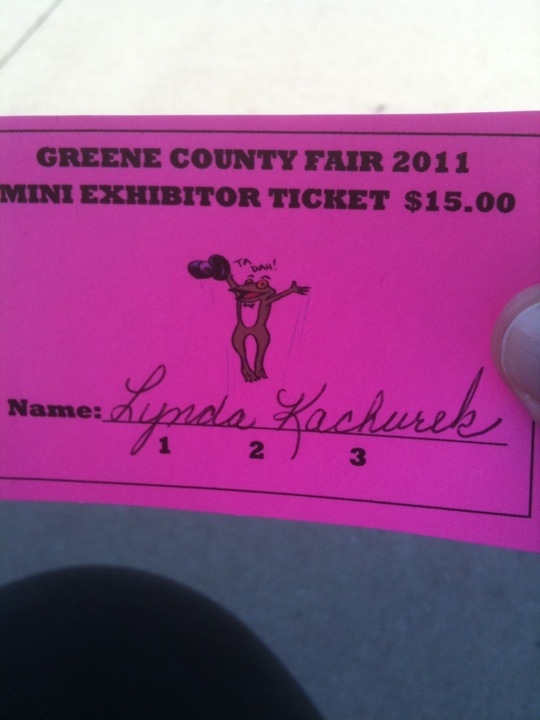 Last year, two of my colleagues entered the county fair for their county and had great success. One even took best in show for her jam, and it was quite delicious! So there was a campaign to get more colleagues to participate this year. I figured it might be fun, so I decided to enter in the domestic arts/baking division. The mini-exhibitor pass allowed up to five different items to be entered, so initially I decided to go for it an enter five. However, a distinct lack of canned pumpkin (who knew you couldn’t find it in July??) 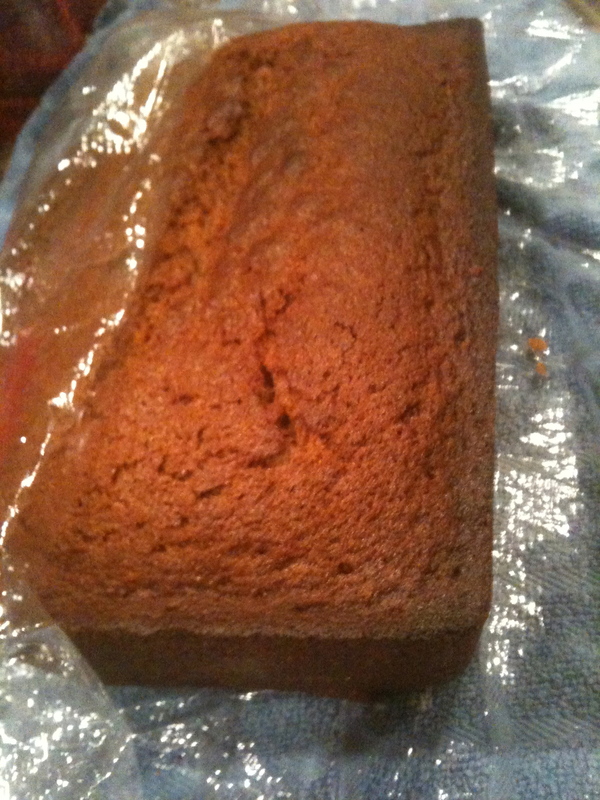 in the stores thwarted my efforts at making my grandmother’s pumpkin bread. In the end, I entered four categories: yeast bread (my honey-wheat loaf), zucchini bread, favorite bar cookies (my cranberry caramel crisps), and bundt cake (my lemon poppy seed). 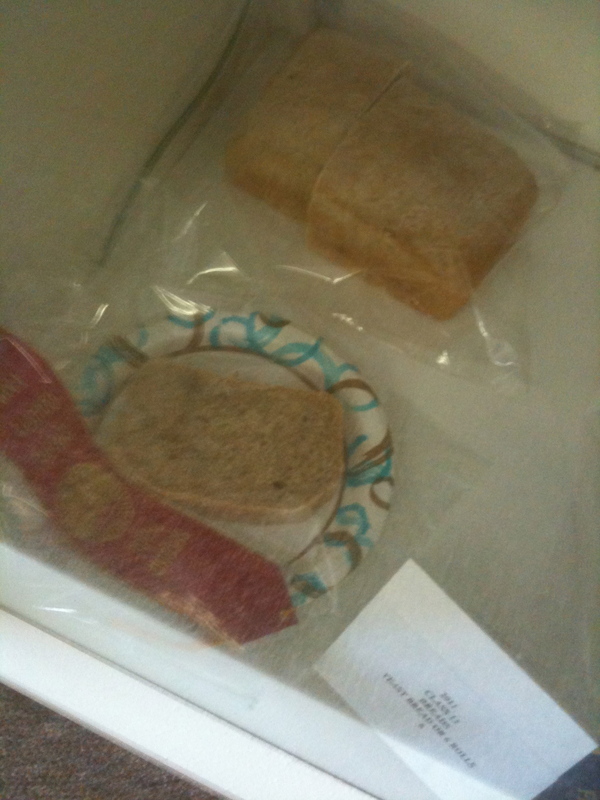 Although I didn’t take home any blue ribbons, I placed second with my yeast bread and my bar cookies. For a first attempt, I’m happy with that! And I’ve got a whole year to work on more recipes for next time. I hope you have a chance to go to your local or state fair. If nothing else, go for the people-watching. Here are some pictures of our adventures at various fairs we’ve gone to the past few years. A great way to spend a day! 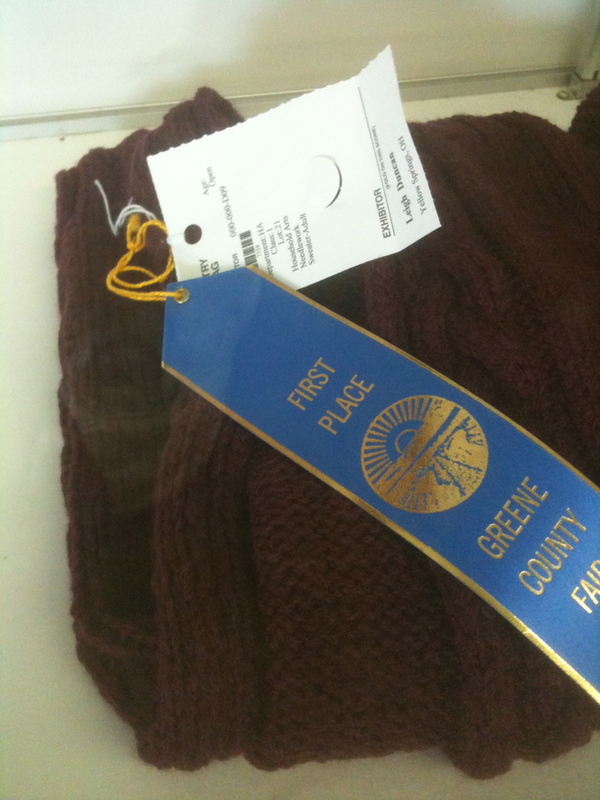 My colleague, Leigh, took first place for her knitted adult sweater! Great job, Leigh!! One of my favorite parts of the fair – the Deeres! 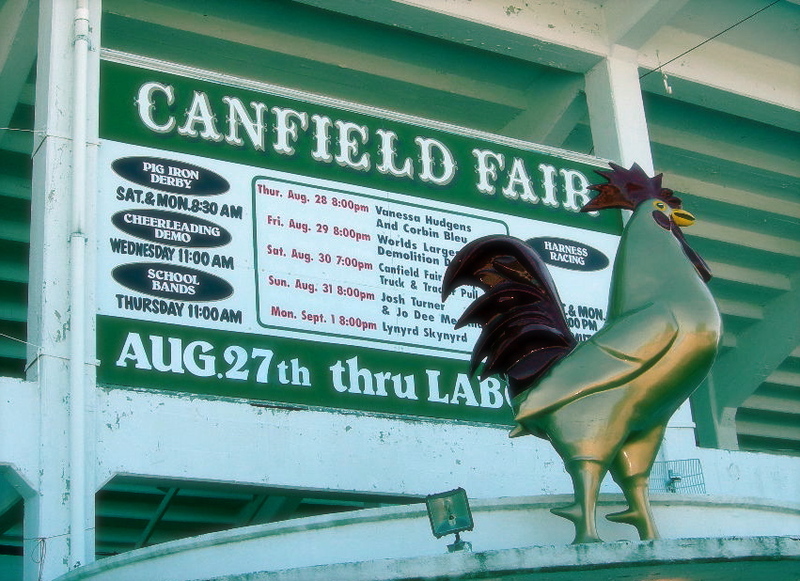 The Canfield/Mahoning County fair near Youngstown is one of the largest county fairs in the nation! Tasting the food at the fair is another great reason to visit! 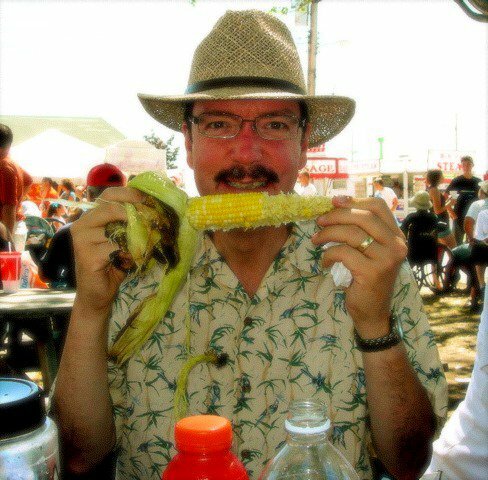 My brother-in-law Bob enjoys some corn at the Canfield Fair. 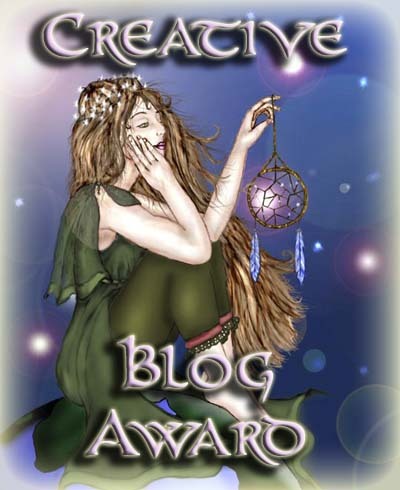 So is the chance to be a little silly! 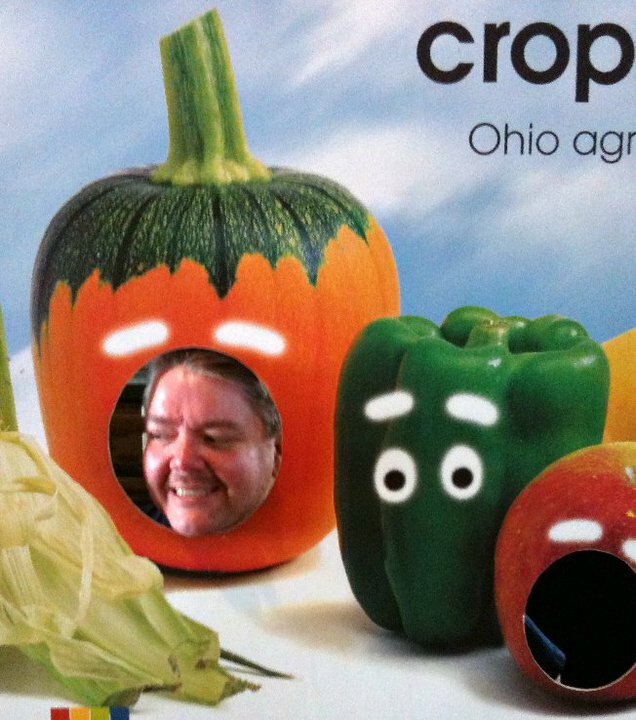 My husband gets his vegetables for the day….. 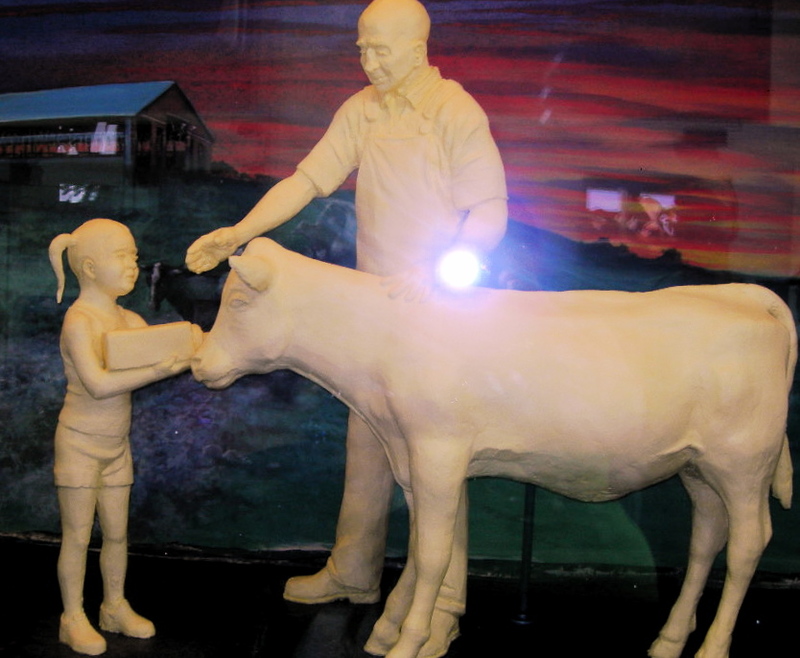 The butter sculpture at the Ohio State Fair is a “must” on the list of things to see at that fair. 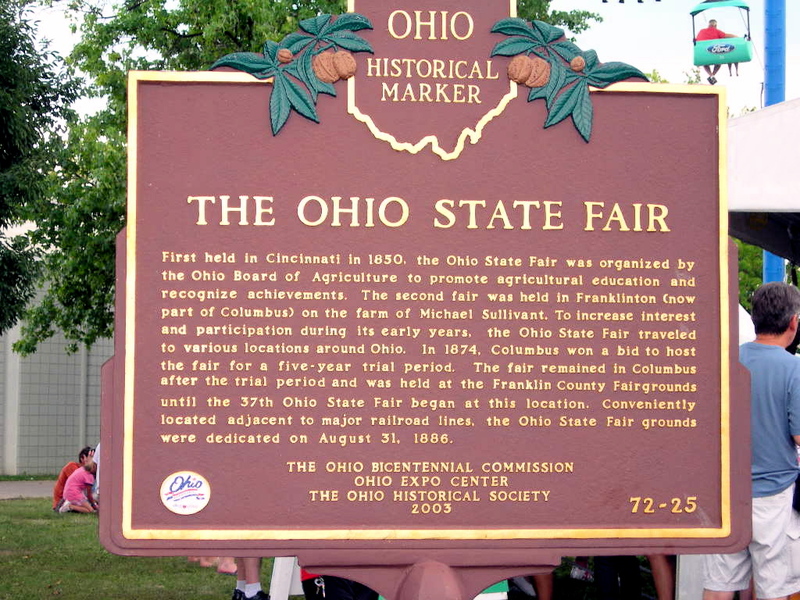 The historical marker at the Ohio State Fairgrounds give a bit of history to fairgoers. 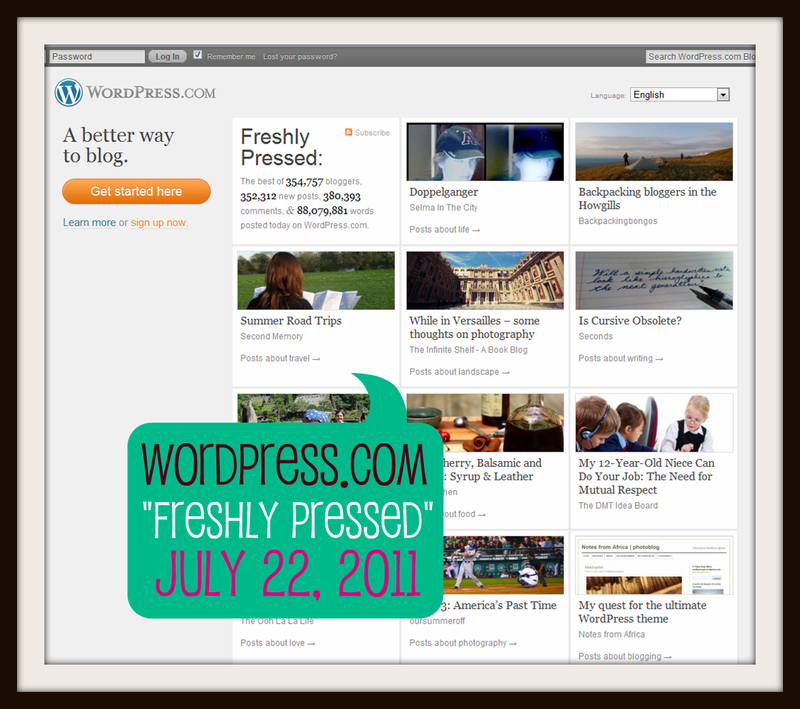 Checking out the various animals and livestock usually results in some interesting moments……. And dust and breeze and first gold leaf on the fairgrounds. There’s just something about going to a county fair that reminds me of the good things in the world. Perhaps it is the innocence in the giggles and squeals of children flying free across the sky on the once-a-year rides. Maybe it is the smells swirling in the hot sticky air, tinged with the scents of food stands and animal barns. But for me, going to a county fair is really about the history. The concept of the fair or festival is centuries old and began continents away. 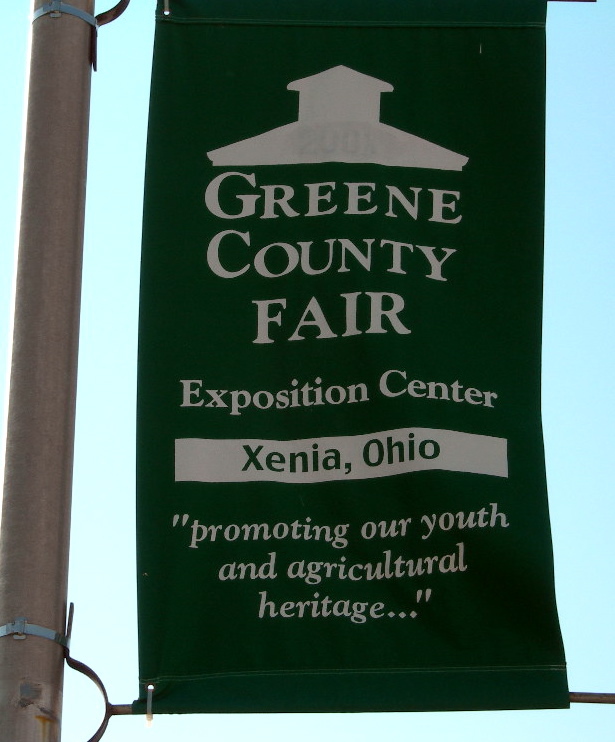 Here in the U.S., Knox County, Indiana, claims to be the oldest county fair in the nation, going strong at 202 years this year. 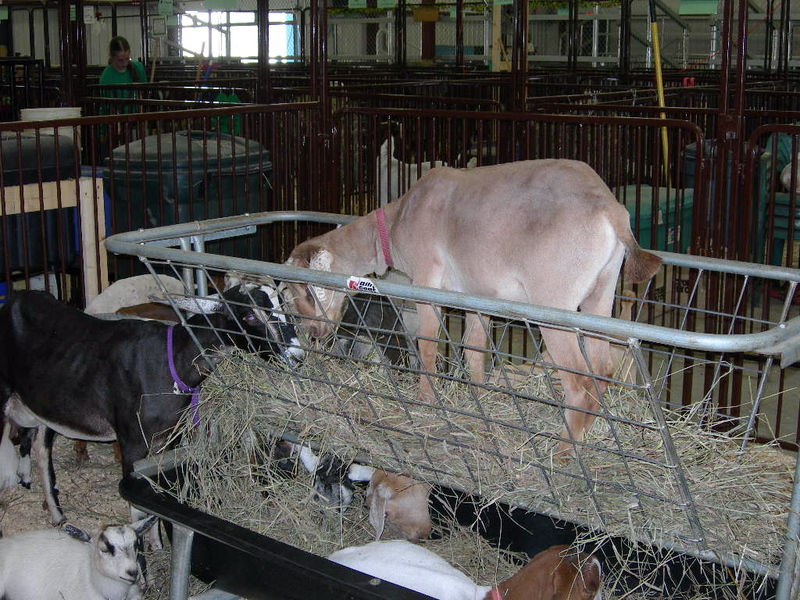 From their origins in the early 1800s, agricultural fairs have always been a gathering place. Rural farm life was isolating, and farm families found both education and a chance to socialize. 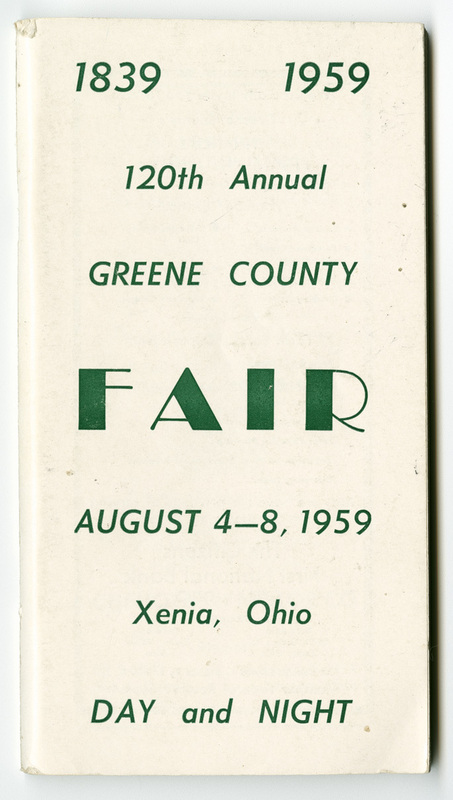 As state and county fairs developed, so did their content, eventually including displays of technology, educational programs, and competitive activities of domestic arts and agricultural prowess. Following the harsh realities of the Civil War, fairs after 1870 became more permanent fixtures, adding elements which are now tradition, including food and games along the midway. Whether going to learn new things about agriculture, see the largest vegetables produced this year, or to lose yourself among the rides and food booths dotting the midway, going to a county fair is just plain fun. By the dazzling lights on the edge of town. Past kids sitting with cows and sheep in a white barn. To pay for their indulgences at the ticket booths. When this is all through. Your benediction for a fading summer. 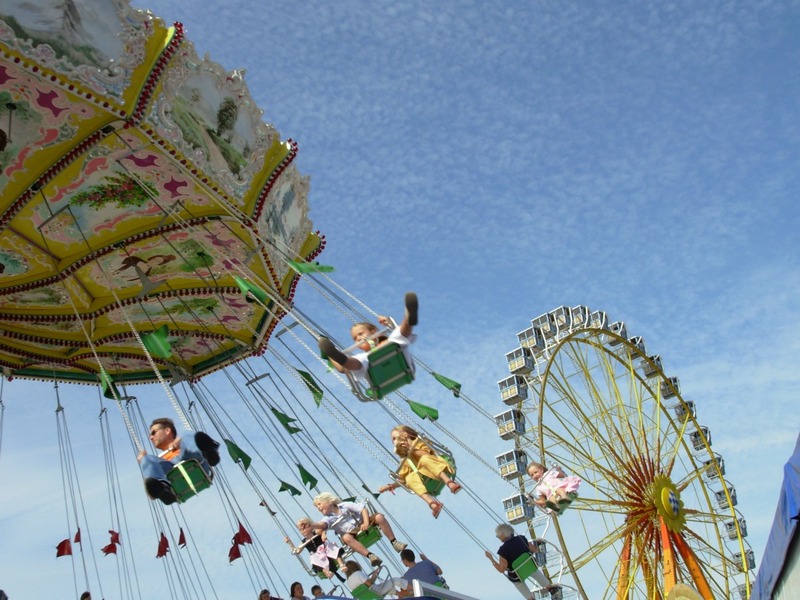 What’s your favorite part of going to the fair? 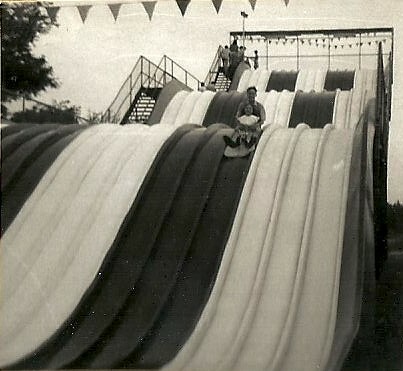 My brother and I loved the slide at the Illinois State Fair. 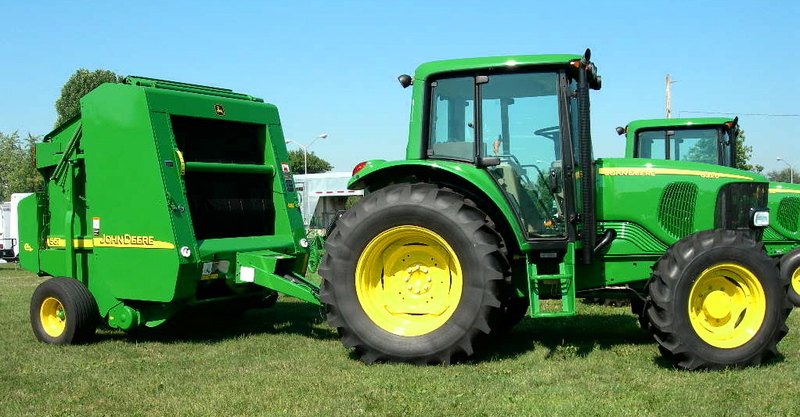 When the calendar turns to August, that can only mean that fair season will soon be here. In fact, my local county fair is going on this week! 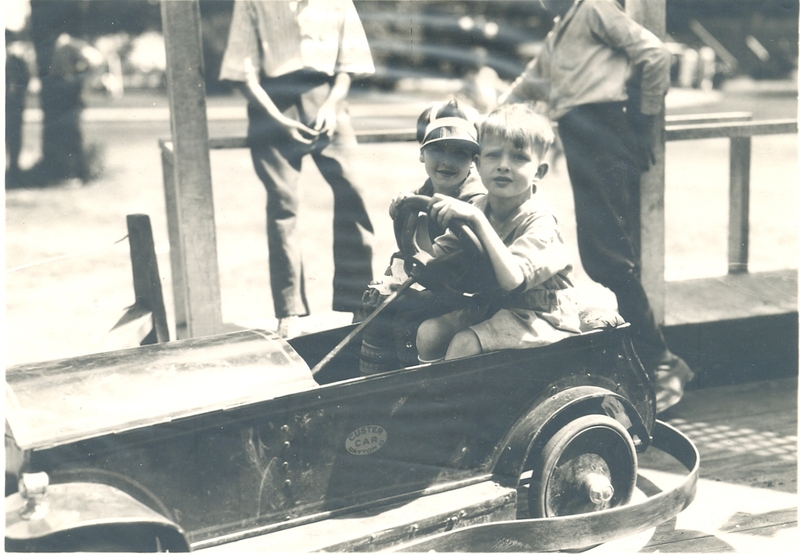 As a child, I was fortunate to live in the county that hosted the state fair. With my father a farmer and my mother an artist, the State Fair was a highlight of the year. Dad always took us through the tractor displays and the ag buildings, learning about new crops, farming techniques, and the latest technology in agriculture. Mom would then take us through the mercantile and fine arts buildings, where we could admire the biggest local produce, the finest in local arts and crafts, and the best of farm kitchens around the state. It was a time to celebrate all the great things we loved about living on a farm. Although he didn’t grow up on a farm, my husband was lucky to live near one of the oldest and largest county fairs in the nation. His memories of going to the county fair make for some amazing stories of fair food, people watching, and precious times spent with family and friends and this once-a-year festivity. So for those who still love all the special moments of going to the fair, we’ll be spending this week on the blog celebrating fair season. Here are a couple of Monday Moments to help get your mind on fair season. If you’re feeling a little bit country, check out Chris Ledoux’s “County Fair” video. Or sit back and enjoy this wonderful segment celebrating farming and the arts from Our Ohio, a production of ThinkTV, our local PBS station. 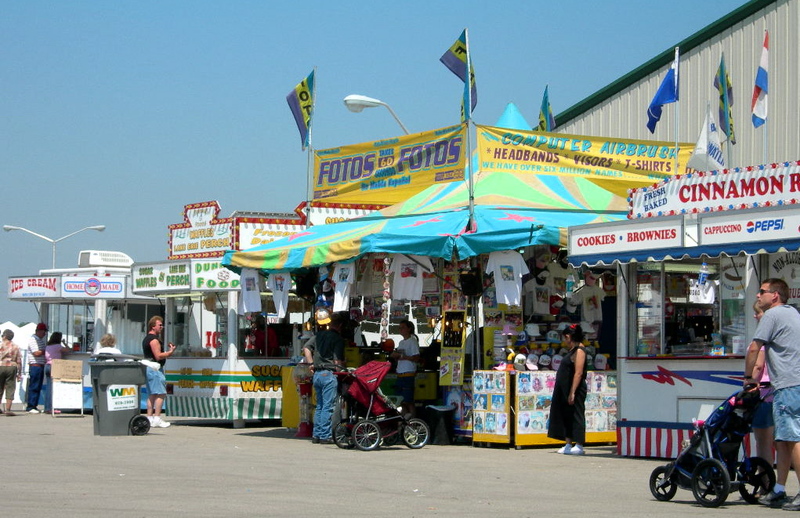 What do you remember about going to the fair?